I f your potty training a puppy or have an older dog that gets a little lost sometimes then we have the best pet stain remover for you. I have two dogs and five kids and I can tell you this stuff works on carpet, upholstery, rugs, and mattresses. Yes I said mattresses. I'm a professional carpet cleaner and I'm in hundreds of Tampa FL homes a year for pet related clean ups. I can tell you that pet stains are the most difficult to deal with. The actual visible stain is not as much of a problem as the odor that is associated with them. I tell all my customers that the best way to remove pet stains is by getting to them as soon as they happen. If you can clean a pet stain while it's still wet you have a chance to get about 80% of out of the carpet. Cleaning it while it's wet removes the urine before it can crystalize and become a real problem. So what's the best pet stain remover? I only recommend one. 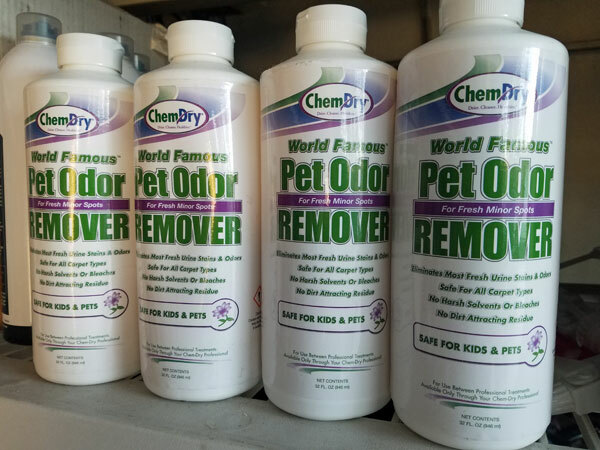 Chem-Dry's World Famous Pet Odor Remover. The pet stain remover does an amazing job of eliminating both the stain it's self and the odor associated with it. It's simple and safe to use. You just pour it on the pet stain and let it work its magic. It's a green certified product that works safely on most materials. I've personally used it on carpet, upholstery, and mattresses. Every time I've used Chem-Dry's World Famous Pet Odor Remover it has worked without failure. For the best stain remover in Tampa FL call Chem-Dry of Tampa.